Back in my gluten-eating days, I had a minor major pasta addiction. I’ve found a great brand of gluten-free pasta that is actually equivalent to regular pasta, if you can believe it (product review to come! ), and I use that all the time! But I’ve always wanted to try making my own pasta, and decided earlier this week that the time is ripe. 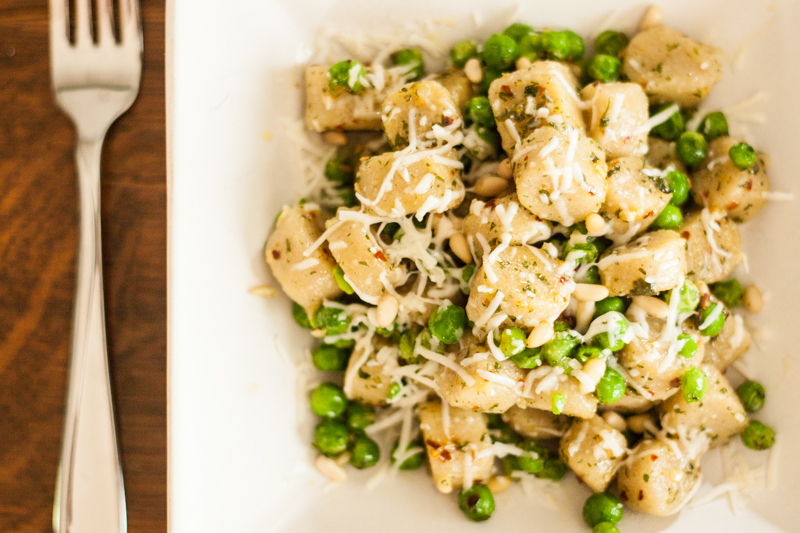 Gnocchi was always a favorite, and seemed the simplest, so I started there. And in an attempt to make it as simple as humanly possible, I made the gnocchi with only TWO ingredients. I’m gonna be real with you…this recipe needs some work. But I think it’s just as important to share my attempts as well, in case anyone else has suggestions for how to make it better! The flavor is great, but the gnocchi itself was a little off. It was very dense, and a little too chewy. I think next time I’ll add in eggs, or perhaps ricotta. Stay tuned for further attempts, but in the meantime, here’s the recipe! 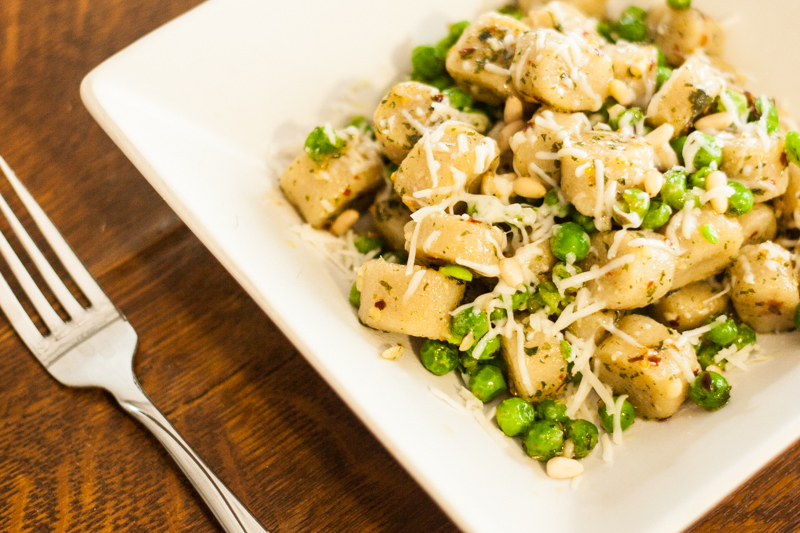 You can replace the scratch gnocchi with any other pre-made gnocchi or noodles. Mound the flour on a counter and make a well in the center. Pour the water in the well. Using a fork, work your way around the well mixing the flour into the water. Mix until the dough is crumbly. Add more water as necessary, if the dough is too dry to come together. Knead the dough until smooth, for about 8 minutes. Wrap the ball of dough in plastic wrap and let rest at room temperature for 30 minutes. Divide the dough into 4 pieces. Roll each of the 4 pieces into a log about 1/2 inch thick, and cut that into 1/2 inch pieces. 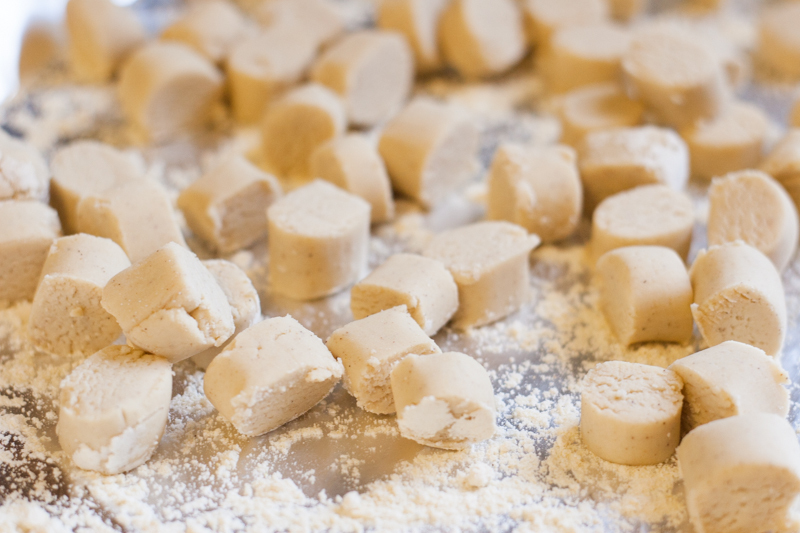 Boil a large pot of salted water, and drop the gnocchi in the water….gently! Splashing boiling water is no good. Drain, and use in the following recipe. Heat olive oil in a skillet over medium heat. When hot, add the garlic, parsley, and pepper flakes, and cook, stirring, for 1-2 minutes or until garlic starts to smell very fragrant and turns golden (do not burn…it will turn bitter!). Take a moment to waft that lovely garlic and oil smell into your nose. Ahhhhhhhh. 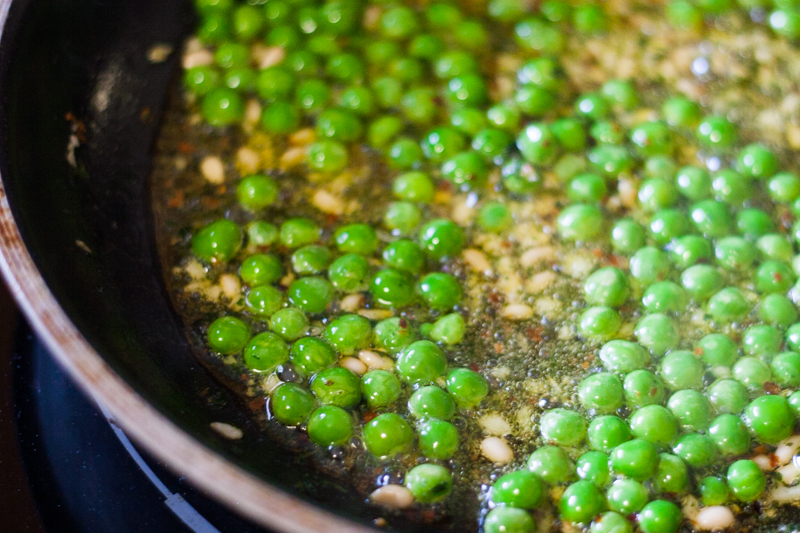 Add in pine nuts and green peas, and sautee for 1 minute. Then, add in the gnocchi and sautee for about 3 minutes, until the pasta is well-coated in the garlic oil. This is going to smell so good you’ll want to plop your face right in the pan. But don’t! That oil is pretty hot. Scoop into a bowl and top with freshly grated asiago! Again, the gnocchi recipe needs some help! If you’ve made gluten-free pasta before and have some good suggestions to make it softer, less dense, and more elastic in dough form, please comment and let me know! I’m excited to continue the GF pasta experiments. What a wonderful blog! I was recently diagnosed with Celiac disease at the age of 50. I have always eaten healthy as I’m a distance runner. I’m super excited to try your recipes! I have heard that gluten free pasta is different but your recipes look amazing. This runner girl will have to rethink the wheat pasta carb loading thing.